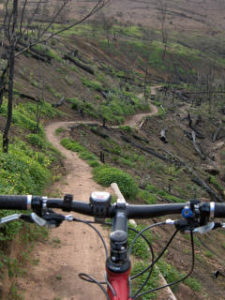 In the Fountains area on the south eastern side has some of the best mountain bike trails in Pretoria. Here you will find Groenkloof, Voortrekker Monument and Klapperkop. Even though they are in the same general area each of them is a little bit different with some unique features. Combined you could easily find yourself riding 50+ km of some of the best singletrack in Gauteng and finest in South Africa. Groenkloof Nature Reserve is probably the most accessible and popular among the Pretoria MTB trail options. You can tell this by how full the car park gets on Sat and Sunday mornings, it is packed. 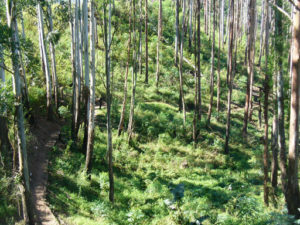 Groenkloof has the most variety in terms of gradients and riding terrain. The entrance gate is just past the fountains gate on the Christina De Wit road and here you can buy a day entry or you can get other longer term permits if you will be a frequent visitor. There is adequate shaded parking as well as toilets and braai facilities, very comfortable for pre or post ride gatherings. The trails are marked but not into distinctive routes but rather various sections that you can piece together depending on your preferred choice of riding. There are many smooth flowing sections of single track that would be suitable for beginners. Then there are several sections of steep rocky single track and jeep track. Being a nature reserve you will have the opportunity to see a variety of antelope and even some giraffe if you can get your eyes off the track in front of you. You can comfortably do 20km in the reserve without doing multiple laps of the same sections. There are no major climbs but lots of up and down and you will get to test your skills on a variety of terrain. Groenkloof is probably the favourite in Pretoria because it caters to all levels of riders, has a variety of interesting and challenging routes, good facilities and the tracks are well managed and safe. You can also access the fountains cross country track from Groenkloof so there is another section to ride as well. You can find more information at the Tswane website as the reserve is administered by Tswana Council. The Voortrekker Monument trail is alot more technical and less flowing but still some really great riding. This trail is also very popular on weekends. The technical singletrack is rocky and makes its way all the way around and up and down the hill that the monument is built on. Most of the trail is in the natural bush with some clearings to reveal some great views across Pretoria. You can access through the main entrance to the monument and also pay entry fee here. Fort Klapperkop was one of the four forts built around Pretoria in 1898. The area around the forts is also a nature reserve and has some marked trails. This is where you will find the most climbing out of the three Pretoria MTB trails. 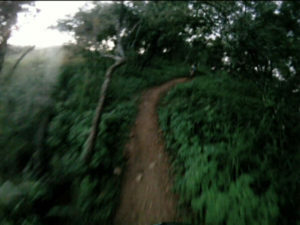 The MTB trail goes up and down and around Klapperkop with some fairly long steep climbs and steep technical downhills. Klapperkop has been used in he past for dome downhill racing. This trail is the shorter of the three but it probably the hardest from a climbing point of view but also delivers the best view of the city. There is a combination of technical rocky tracks and some flowing singletrack. 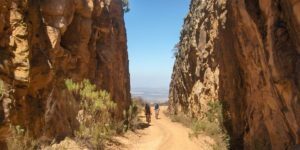 These three mountain bike trails in Pretoria are situated very close to each other and can be combined into a one serious days riding in which you will ride some of the best singletrack around all in one day.